Anyone visiting Jackson Hole in the winter will soon come to realize what a fun and beautiful place it is. There are many things to enjoy here that will keep everyone busy for the whole holiday. 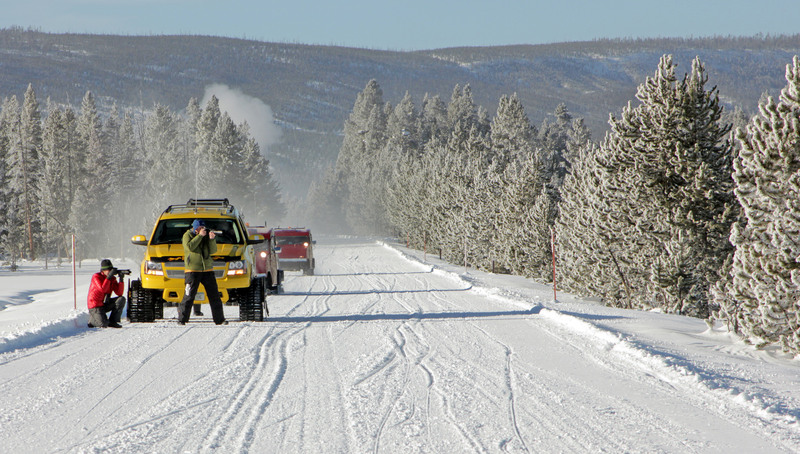 However, one thing you really don’t want to miss out on is a snowcoach tour in Yellowstone Park. Yellowstone is not far away at all from Jackson Hole, and many visitors to the area decide to visit the national park at some point during their stay. Here is what you need to know to organize your exciting snowcoach adventure. Snowcoaches are similar to standard tour coaches but they have had their wheels replaced with tracks to allow them to travel over the snow. They are able to easily travel over snow-covered roads that have been groomed, and when you go on a tour you will be traveling on the same roads that are used in the summer. Snowcoaches often use rubber tracks that allow them to travel over thin snow and patches of bare road without causing damage. They usually come with large windows that provide you with the perfect way to watch the scenery and spot wildlife, as well as taking photos. Overall, they are the simplest way to enjoy Yellowstone in the winter, no matter what the weather. You will also get to know the other travelers during the day as well as your driver who will point out the highlights along the way. Tours usually run from December to March, so anyone booking Jackson Hole luxury hotels during the winter should have no trouble arranging a tour. However, check the tour operators for specific dates and times, and make sure you book yours in advance. The coaches are heated so you will be warm enough inside, but they usually stop off so you can view wildlife or go for a short walk. It is therefore a good idea to take a hat and gloves as well as snow boots. You are likely to see a wide range of wildlife on your tour, so make sure you keep an eye out for wolves, bald eagles, herds of elk, bison, geese, and more. You will also be able to see rivers, thermal mists, and the majestic geysers. You may even be able to combine your snowcoach tour with another activity such as cross-country skiing or snowshoeing. There is no reason why you cannot enjoy Yellowstone during the winter, so don’t make the mistake of thinking it is inaccessible even if the snow is heavy. There are a number of highlights you can see, so check with your tour organizer to find out where they can take you. For example, you may go on a tour to Old Faithful. This may take you along Firehole River and through Firehole Canyon, and you will then get to admire the most famous geyser in the world. You may go to Norris Geyser Basin by traveling along the Gibbon River, and here you will see many active geysers including Steamboat Geyser, the tallest in the world. Or you could go to Madison Junction by traveling along Madison River. Highlights along the way include the Madison Plateau and the Yellowstone Caldera, and you may also be able to see herds of bison and elk. If you are planning a winter trip to Jackson Hole and you plan to visit Yellowstone National Park, make sure you book your trip on a snowcoach. It will be fun for the whole family and you’ll get to enjoy a unique way to travel through the park, so start planning your trip today. Lillian Russell is a retired travel agent and avid writer. Whenever she finds a great destination, she likes to post about it on the web. You can read her articles on many websites and blogs today.